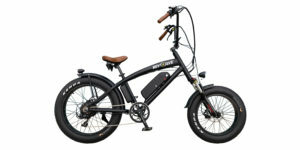 In recent years, Magnum has expanded their line of electric bikes for sale in the US, and the Cruiser is one of the newest models. It builds on the 28 mph top speed, pedal assist + throttle operated, extra-large battery concept that the Metro and Peak models also use, but really emphasizes comfort and style. 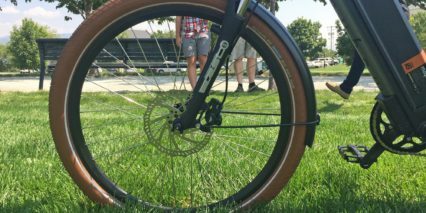 With a bottom bracket that is pushed forward and smaller 26″ diameter wheels, you can more easily mount, stand over, and stabilize this bike at stops. When it comes time for pedaling, you still get decent leg extension because the cranks are positioned forward. And upper body position is extremely adjustable here, you can angle the high-rise bars forward or back to suite your arm length and the adjustable angle stem can raise or lower the base position. When you combine puffy padded grips with an enlarged comfort saddle, fatter 2.15″ balloon tires, and an adjustable suspension fork, you end up with a very satisfying ride. 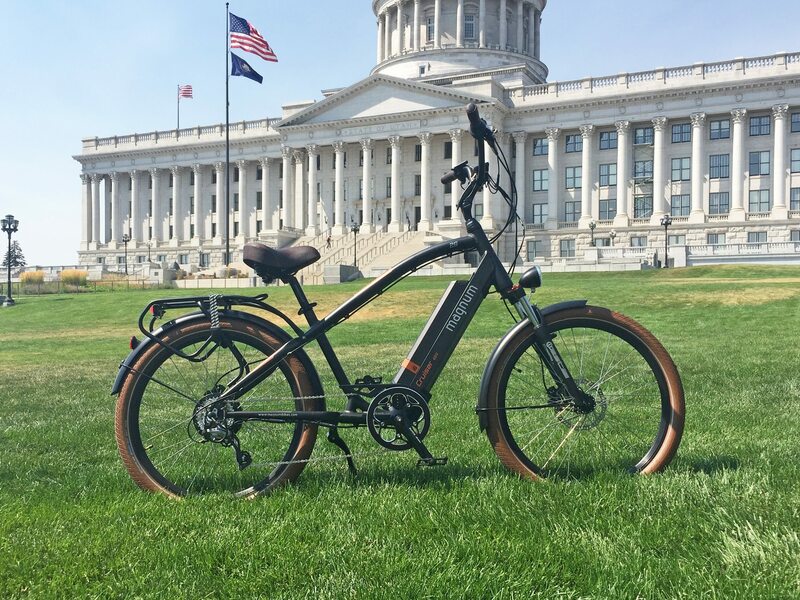 This is one of the few cruiser style electric bikes that’s priced within reach for a large audience, and still comes with fenders, lights, and a custom mid-frame battery pack. 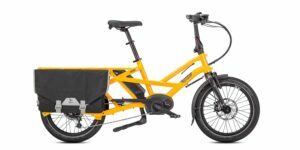 In my opinion, it really does offer a great value… even if you decided to remove the fenders and rear rack to emphasize style and shed a few pounds. Weighing in at nearly 60 lbs, I was surprised to discover that the Cruiser model is not heavier than the similarly specced Metro. The Metro just looks lighter to me because it’s a commuter frame with skinnier tires. 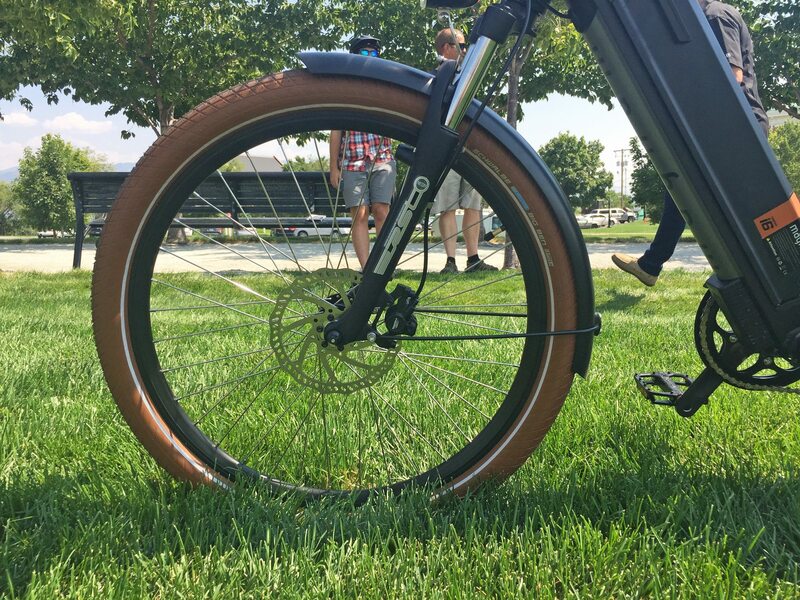 The features overlap quite a bit, though the Cruiser has a 180/160 mm disc brake setup vs. 180 mm for both on the Metro, and the Metro also has an integrated headlight vs. independent lights on the Cruiser. I think the big decision between the two should be based on body position and ride style. 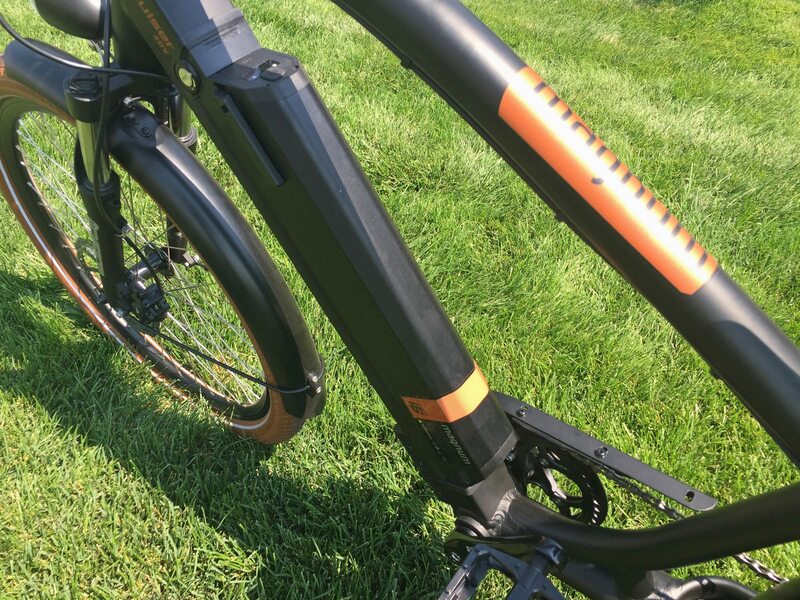 If you care about active pedaling on a narrower saddle and more forward aerodynamic position, get the Metro. Otherwise, the Cruiser is just as capable. 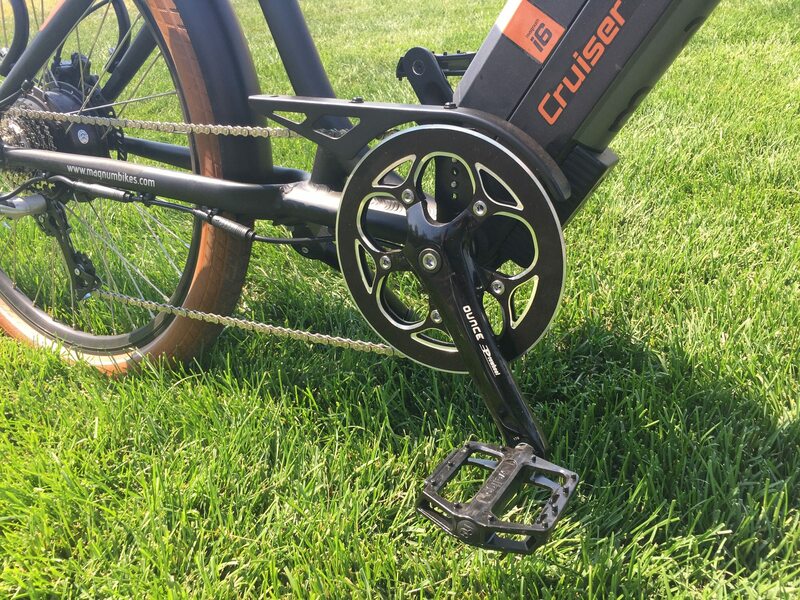 Note that the Cruiser frame is only available in this swooping high-step design and you can only get it in black with bronze accents at the time of this review. 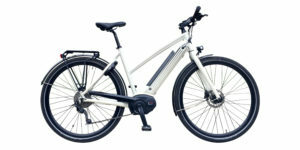 Driving this ebike is a very capable Das-Kit internally geared hub motor rated from 500 watts nominal to 700 watts peak. The motor controller offers 9 Mosfets and puts out up to 18 Amps for smooth, quiet, and powerful operation. Notice how large the controller unit is, and how it’s mounted outside of the frame (there near the bottom of the downtube). It’s insulated against water, just like the motor, display panel, button pad, and battery, but gets more direct airflow here. I also believe that they positioned it as they did, so that the battery could slide down lower for improved frame balance. Everything works together and while the aesthetics are slightly altered, the controller box is mostly hidden by the chainring and I feel that it is mostly out of the way of water and debris because of the large alloy front fender. As with all internally geared hub motors I have reviewed, this one does produce some electronic whirring noises. 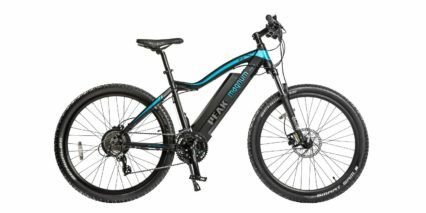 It does not interfere with pedaling, so you can shift easily and smoothly regardless of power delivery, and it works best if the bike has a little bit of speed going. 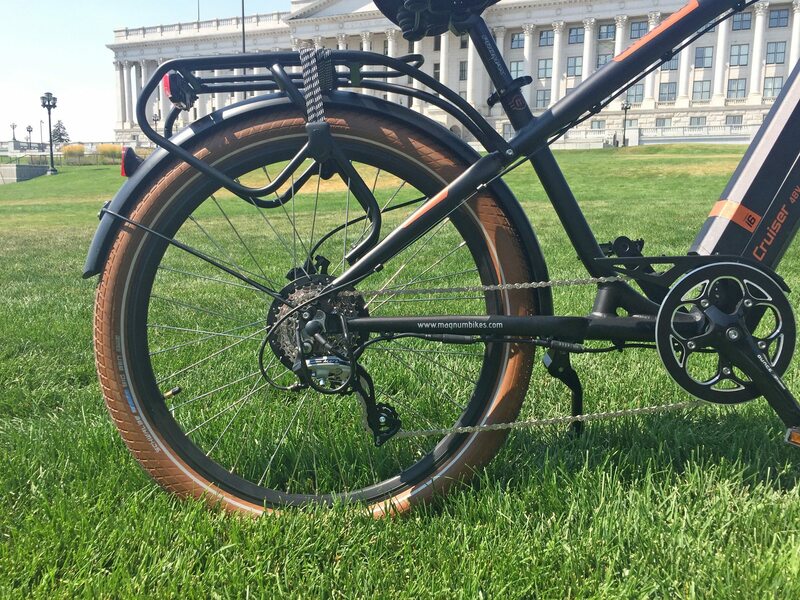 I was able to climb some steep sidewalk sections in a garden area near the capitol building in Salt Lake City and had no issue once the bike got going a few miles per hour. I only weigh 135 lbs, but got the impression that this bike would be capable of handling heavier riders and gear on the rack. The rack is rated to 55 lbs. Perhaps the best part of this setup is that the motor can be activated anytime the bike is powered on by simply pressing the trigger throttle near the left grip. 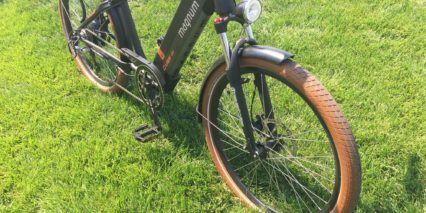 It’s wonderful to have such control at your fingertips and not have to pedal… but this will drain the battery quickly, and if you’re starting from standstill on a steep incline it may struggle. The throttle offers full power if you depress the trigger throttle all the way but maxes out at 20 mph. If you want to hit the maximum speed of 28 mph, you will have to arrow up into the highest level of assist and pedal along. That said, you do not have to push while pedaling because this bike relies on a cadence sensor to measure crank movement, not crank torque. For those who are interested in lower speed operation, Magnum or your local dealer can set a different top speed. Coming back to the throttle for a moment, take care to always turn the bike off when dismounting or moving it because the throttle is always active and could easily get bumped. This could lead to the bike getting out of hand and crashing. Supporting that powerful motor is an equally powerful high-capacity Lithium ion battery pack. It offers 48 volts and 13 Amp hours for a total of 624 watt hours (over half a kilowatt hour!) that should take you anywhere from 25 or 30 miles up to 60+ miles per charge. The range is fairly wide and imprecise because speed, rider weight, and terrain greatly influence operation. If you always use the first one or two levels of assist and rarely juice the throttle, it will go much further than if you sit back and zip around like a scooter. The battery pack fits neatly into the downtube and clicks in from the left side. You can charge it on or off the bike with the included 2 Amp charger, but be careful with the plug interface because the charger wire ends up in the path of the left crank arm and could get snagged or bent if you turn the pedals accidentally or move the bike when it’s plugged in. I also noticed that the little rubber cover that seals the charging port on the battery can be difficult to press in. Near the top right side of the battery is a second port which has a standard sized USB female plug for charging portable electronics. 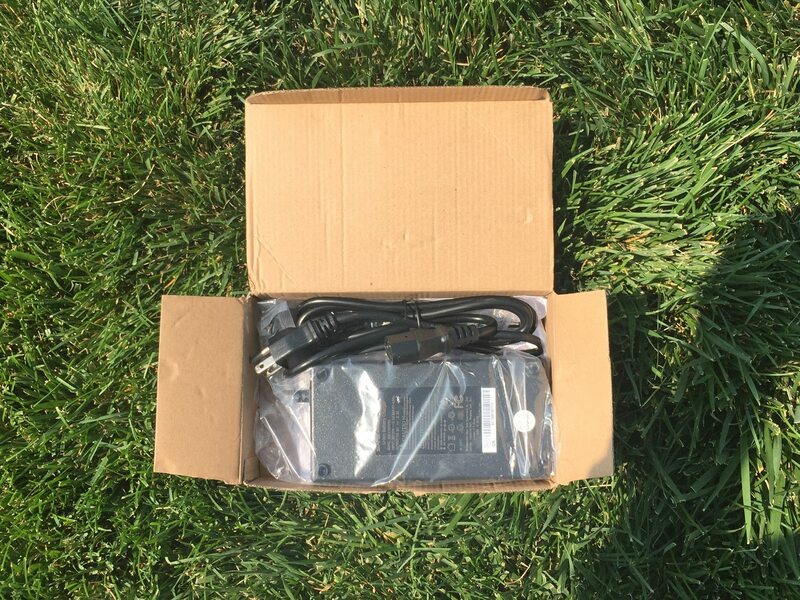 You could use this while riding the bike to keep your phone charged (perhaps if you’re using it for GPS navigation) or when the pack is off the bike, as a backup source of energy. The rubber cover for the USB port fits much easier and I appreciate that this plug is out of the way of the cranks and your legs when pedaling. 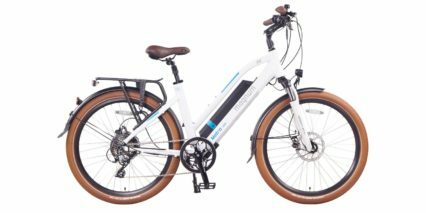 So, you can also take the battery completely off the bike for storing or charging inside, which is convenient if you work in an office and have to park the bike outside. Lithium-ion batteries tend to be very durable but it’s best to avoid extreme heat or cold to really make them last for the 1,000+ rated full cycles. 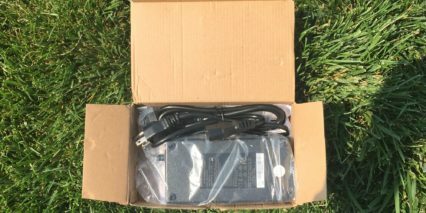 Note that this battery pack weighs about nine pounds, and would be worth taking off if you have to lift the bike or transport it on a car rack. The front wheel can also be removed with a simple quick release mechanism and the seat post is the same way. 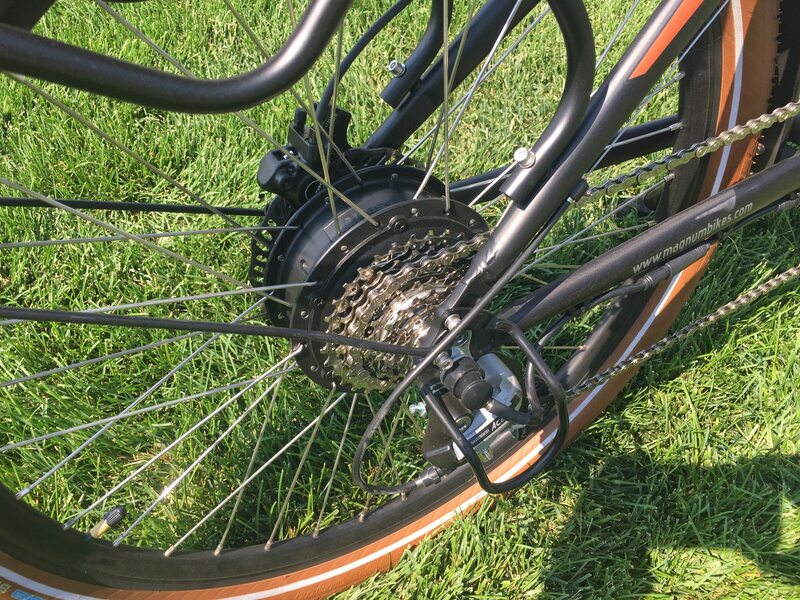 You will need some tools to get the rear wheel off, but there’s a simple disconnect port on the motor power cable to make it easier. Operating the Magnum Cruiser is simple and clear. Once the battery has been charged and mounted, you press the rubberized power button on the pad situated near the left grip. The Das-Kit LCD display panel blinks to life, and you can tap the power button once more to turn on backlighting. Unfortunately, this display does not activate the headlight or tail light. They are both independent, relying on AAA batteries and separate on/off switches. This is a grip for me because the battery is so large and easily rechargeable. It takes extra time and memory to switch the lights on and off when parking, but at least you get the lights, and I appreciate the reflective tire casings as well. Since this is a black colored bike, it’s important to have some front and side reflection and lights if you plan to ride in early morning or late evening conditions where automobiles might miss you. Note also, since the headlight is mounted to the moving portion of the suspension fork, it may create a less consistent beam and even get jolted out of place over time. During my test rides, I took the Cruiser down some steps and across a few very bump sections of sidewalk, and I could hear the kickstand bouncing up and down. But the fenders and light seemed solid. It was easy for me to look down and get a sense for speed, battery capacity, and assist level because the display panel is so large and centrally mounted. I do wish that the display was removable, for reduced wear at bike racks, but it’s better protected than most because of the taller handlebars. The button pad allows you to arrow up or down for more or less power and speed with assist… but remember, the throttle is always hot and offers up to full power depending on how far you push it. 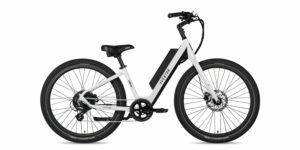 This is a more advanced and “full control” setup than a lot of other electric bikes and as a regular, possibly more confident rider, I love it. You can hold the down arrow to activate walk mode for climbing steep sections or just taking a break. It’s useful if the bike is loaded with gear or when you’re walking through tall grass or other soft terrain. 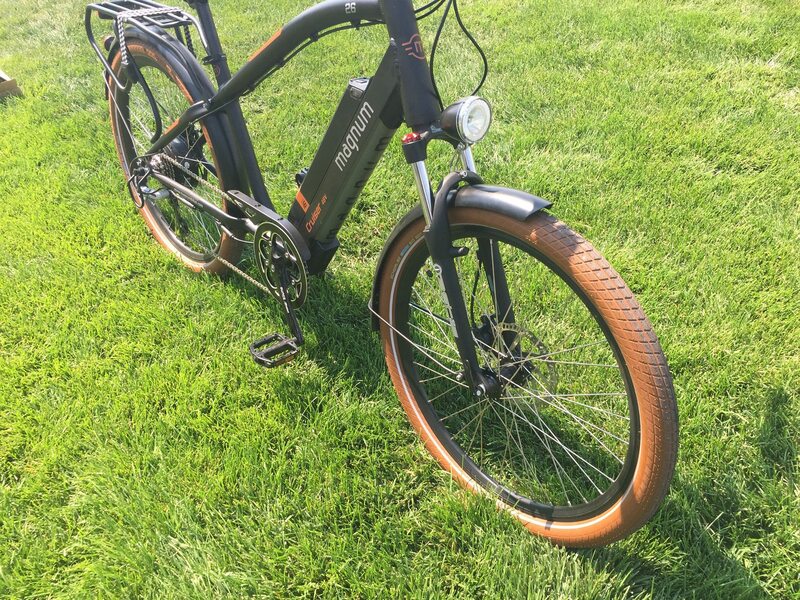 There’s a lot to say about this electric bike because it’s packed with features. The fenders are correctly sized for the large balloon tires and the plastic chain cover kept my pants clear of the chain. 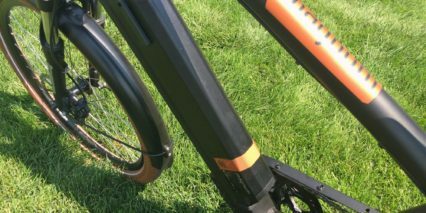 There’s also an alloy bash guard that would protect the chainring from curb strikes and other tall obstacles… but that’s a bit overkill for more of a neighborhood/urban styled ebike. 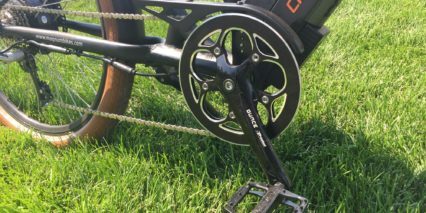 I think the chainring guard looks nice, but wouldn’t mind having a full chain guide (a second plate on the inside) to keep the chain from bouncing off track. I never dropped the chain during my test ride, and did appreciate the plastic sticker style slap guard to protect the black paint on the right chainstay. Even the kickstand has been optimized here, though not completely 100%. 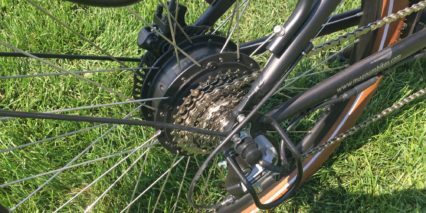 It is positioned far back enough on the left side to stay mostly clear of the left crank arm when walking the bike backward or servicing the chain, as long as the pedal is not in the flat position when it passes. 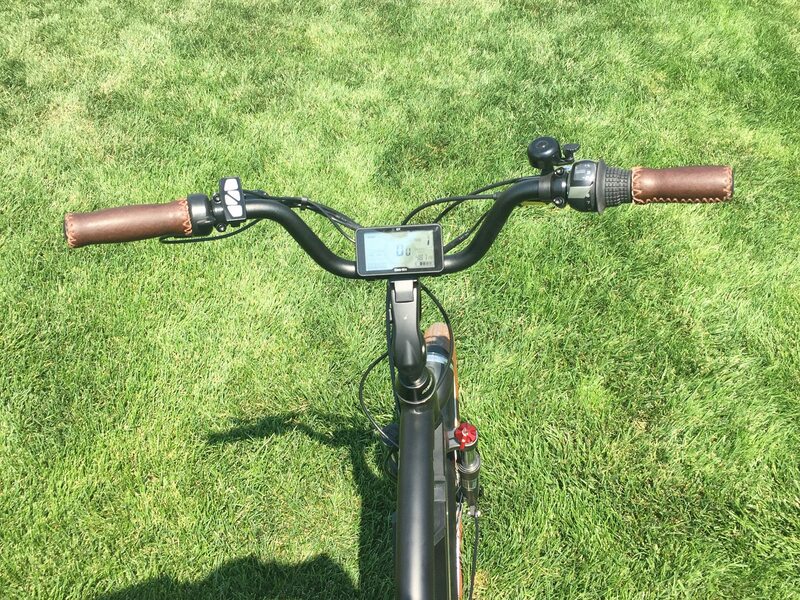 This stand is adjustable for length and supports the bike well, even in soft grass. 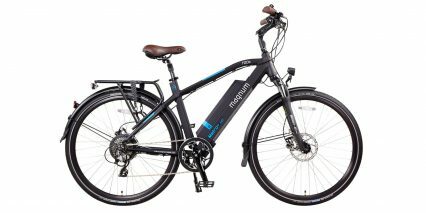 Magnum continues to do a great job with their purpose built, value oriented electric bikes. To some people, $2 might not sound affordable, but you get the proper assembly and year long support that dealers can offer with this product. 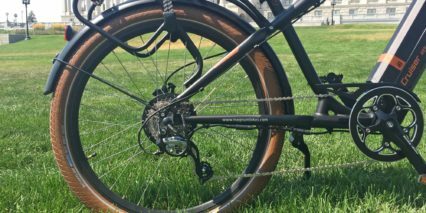 Little extras like the derailleur guard keep your gears and the motor cable in good shape if the bike tips or is parked next to other bicycles in a rack, and the internally routed cables look nice and stay protected. Stopping is a big deal, especially because this bike is heavier and capable of high-speeds, so the hydraulic disc brakes with motor inhibitors are a win, and the little bits (like the custom rack with pannier blockers and bungee cord) all add up to something really special. I’d like to thank Magnum for partnering with me on this review and bringing their Metro model for side-by-side comparison. 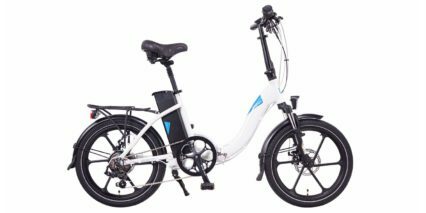 I feel like they have a good model here, balancing value against performance and service, and enjoyed this ebike very much. 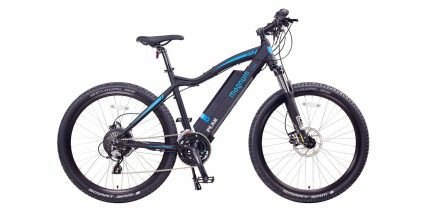 This eBike is very fun and is built strong; however, the Magnum pedal assist controller goes from level 6 down to level 0 and then rolls back around to level 6. It is very easy to accidentally click one time too many and when you thought your assist is off, you get thrown forward with full assist. I was at a local dealer the other day. It seems like the latest firmware on the controllers does not allow going from 0 to 6. I believe it still allowed going form 6 to 0. Maybe they heard you. Court, I enjoy your reviews. I have a question that perhaps others here may have, so your answer would be much appreciated. 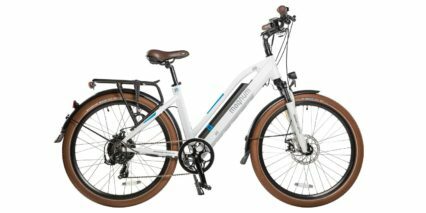 I am about to be a first-time ebike buyer. I have researched maybe 50 bikes over the past three months and test-rode five. My favorite is the Magnum Cruiser. The only hold-up is the nearest Magnum dealer is 100 miles from my home. 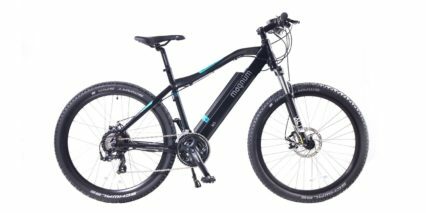 My local Velofix franchise said they could service the Magnum, but as they don’t have a partnership with them it could be two weeks to get a part. Also, I am not handy at all. 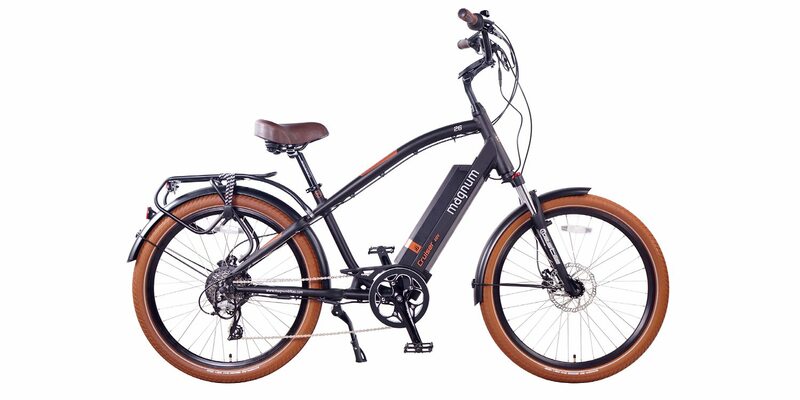 Do you think I should forget the Magnum and buy my second or third favorite choice (Raleigh Retroglide or Pedego Classic Cruiser) because they have dealers in my town? Very different specs, I realize that. Thanks for the reply. If I buy the Magnum Cruiser, I don’t mind making the 100 mile trip to get it and maybe again for the free 30-day tune-up. Plus, I like the store owner and like supporting a family-owned business. 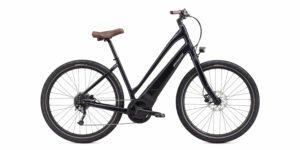 I am test riding the Raleigh Retroglide Step Over next week at my local bike shop, then I will decide. I think because the Magnum is more powerful, I will end up with that and just get it serviced by either the local shop where I live or by Velofix. The owner of the store that carries the Magnum told me he’s sold 80 Cruisers and not one of them has come back within the one-year warranty with a problem. Last thing: Do you plan on reviewing the 2018 Retroglide any time soon? As you know, it’s different (battery moved to down tube, etc.) than the one you have up on the site. Hi! Thank you for making this review! 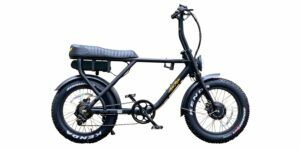 I am starting a bicycle tour company and want to use e-bikes because the city where I live is very hilly and a bit sprawling. 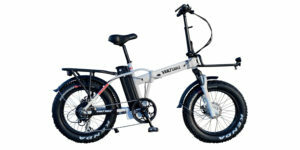 I’m trying to choose a bike to use for the tours and am leaning towards the Magnum Cruiser, Magnum Metro and Faraday Cortland S. I like the Cortland S because I think it is has a nice design, and because it does not look like an e-bike will hopefully appeal to cyclists who are e-bike skeptics. 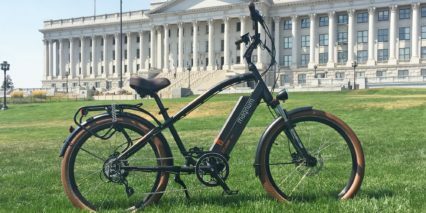 Do you think the pedal assist with the Faraday Cortland S is powerful enough to offset the difficulty of biking up a hill for people of all ages and sizes? The hills are sloping to fairly steep though not a lot of long steep hills. If I cannot get a good deal from Faraday for the Cortland S, then I will be buying from Magnum. Do you think the Magnum Cruiser or the Metro would be better for a bike tour company where many different types of people would be riding them? I’m leaning towards the Cruiser because I like the design but would like to go with the more practical of the two for a bicycle tour company. 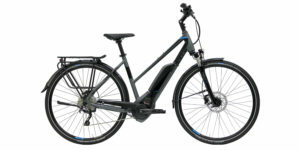 Also, I have never owned a cruiser style bike and am not sure how practical it is for a hilly city even if it is an electric bike. Thank you again! I love the Cruiser but… and this is a big but,the placement of the throttle is downright dangerous. It is sooooo easy to bump by accident and have 60 pounds of metal take off (and I mean take off!!!) 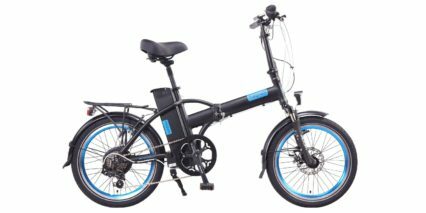 Other ebikes I tried have either a button throttle or a twist on the handle bars. Both of those options make it harder to accidentally engage this important feature. As a lawyer I suggest Magnum re-think the throttle design and placement before someone has a really bad experience. Interesting, thanks for the input Mark! I’ve had the opposite experience in a couple of situations where the half-grip twist throttle was engaged while riding (since my hand slipped around or twisted slightly as I grabbed on harder during an intense moment of steering or braking. 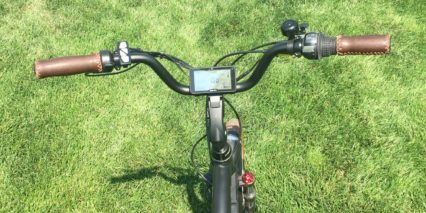 I prefer trigger throttles on any sort of off-road ebike because they stay out of the way. Twist throttles however, work very well for cruisers and city bikes where terrain is more predictable. I think a lot of it comes down to personal preference… like jet skis with trigger throttles vs. motocross motorcycles with full grip twist throttles. The trigger throttle is easy to use but the way it is placed on the Magnum if you are stopped and lean forward to reach for something, or are walking the bike it is very easy to hit it (I have done it and even the dealer I bought it from did when moving the bike). As for a twist throttle, I can see how that could be a problem in an off road situation. Just bought two Magnums, a Cruiser for myself and a Metro for my wife. I LOVE these bikes! I always drive European cars because of the quality and workmanship and being a bit of a snob was looking to buy a Bulls, or Gazelle, or Focus, all excellent bikes, until I tested the Magnums… For half the price, I have an excellent bike of equal, and in some measures, superior quality. I HATE that it comes from China, but the riding experience tells the truth. I bought them from a great local shop in Charlotte NC called Charlotte Cycles. We all have lots of options to buy from the big box stores and online. Its crucial for our economy to support the small local stores! I picked Charlotte Cycles because of their great price, but more importantly, great service and, most importantly, supporting the local economy!